Qualcomm Next Generation flagship Mobile Chipset Snapdragon 855 has just launched. Some information about this processor became public even before its launch. The code name of this processor is 8155. This processor will be the world's first commercial mobile platform, which will support Multi Gigabyte 5G. Apart from this, this processor is offering us 7 nm chipset. What is the 7nm chip? 7nm tells the half-pitch measurement of the nodes in the chip. In other words, if you want to measure the distance between the node and its nearest node neighbor, and this measurement was 14 nanometers, then 7nm is half pitch. According to the source, Qualcomm has not officially announced it yet, but the brand's manufacturing partners say Snapdragon 855 will be the world's first 7nm SoC. The new SoC company is also expected to come with the X-24 LTE modem, which can support up to 2Gbps LTE speed. It can also support upto 2 GHz per second LTE speed. Qualcomm Snapdragon 855 will also have three CPU clusters and four power saving core clocks, with a maximum speed of 1.7 GHz. Apart from this, three high end cores will work on 2.42 GHz. Also, the highest speed is 'Gold Core', which can be clotted up to 2.84 GHz. Even in this Adreno 640 graphic processor is also provided. Qualcomm's latest flagship processor, Snapdragon 845, which is composed of the 10nm Low Power Plus (LPP) fabrication process. This is a slightly up-gradated version of the 10nm Low Power Early process, which was used to build the Snapdragon 835 processor. With the new 10 LPP manufacturing process, you get 10 percent better performance or 15 percent less power consumption. 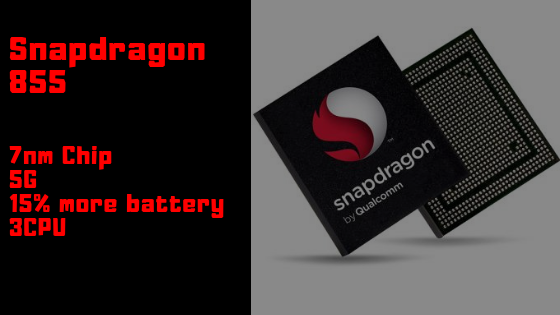 The new processor Qualcomm Snapdragon comes with 855 snapdragon X50 modem which provides 5G connectivity. Apart from this, this will further enhance the experience of gaming and Snapdragon 855 will feature the feature of snapdragon elite gaming. Qualcomm Snapdragon 855 will help in improving Augmented Reality and it will take gaming to the new level. In Qualcomm Snapdragon Technology Summit 2018 OnePlus informed that its next flagship phone will be one of the earliest handsets coming up with the Snapdragon 855 processor. At the event, Pitta Lau, CEO of the company announced that OnePlus will be the world's first 5G smartphone that will run on the EE Carrier Network of the United Kingdom in 2019. Remember that Qualcomm Snapdragon 855 processor was launched only a few days earlier. It comes with a better AI engine and 5G modem. OnePlus's next flagship smartphone, which launches in 2019, will come with the new Snapdragon 855 processor. The company has insisted that it will bring the first phone with this processor in the market. It is worth noting that in the soon-to-be launched Sony Xperia XZ4 also has a headline market for Snapdragon 855 processors. In the market like America, the Samsung Galaxy S10 series handsets will also come with Snapdragon's latest processor. In this case it will be very interesting to see which smartphone first comes with this processor. Pett Lau said in the summit, "OnePlus only makes a flagship smartphone, so the best and the only option for us is the Snapdragon 855 processor, we are very excited about its powerful performance and 5G capabilities. The user will be providing the best technology and the best user experience." Speaking of the 5G device, he said that the company will also bring the world's first commercial 5G smartphone. Earlier, the company had indicated that its 5G phone will not upgrade to OnePlus 6T. This phone will be brought under a different brand. In such a situation, Pete Lau's latest statement has not been very clear.